UNC's Division of Pediatric Oncology & Hematology. you can continue supporting our cause through donations online or by check. The UNC Division of Pediatric Hematology Oncology is proud to present the annual Pedal for Peds Bike Ride. Ride 7, 10 or up to 50 miles on the beautiful American Tobacco Trail. Participants are welcome to ride all or part of the route. 100% of all proceeds raised by this event will be used to support our mission to care for and cure all children with cancer and blood disorders in the state of North Carolina. Our 2018 event is now over. Be sure to join us in 2019 for our 10th anniversary in the Fall of 2019! Note: Registration for the 2018 Pedal For Peds event is managed through RaceEntry.com. Clicking on the registration link above will take you to our official 2018 Pedal For Peds sign-up site on RaceEntry.com. Other ways to support us through out the year and get involved. Get into the Pedal For Peds spirit with our official gear! All proceeds from the sale of our merchandise will go to support our programs at UNC. Official 2018 t-shirts, water bottles, bandanas, hats, bags and more are now available! Our store remains open through out the year. Previews of our selections are below. Check out our Pedal For Peds store on Zazzle.com to order on-line now. Pedal for Peds is a day of celebration where survivors are honored and celebrated by their friends and family, those who have lost their battles are remembered, and together we carry on the fight one pedal at a time. Our program is dedicated to bringing awareness of Childhood cancers and benign blood diseases and raising funds to support research that will improve patient outcomes. 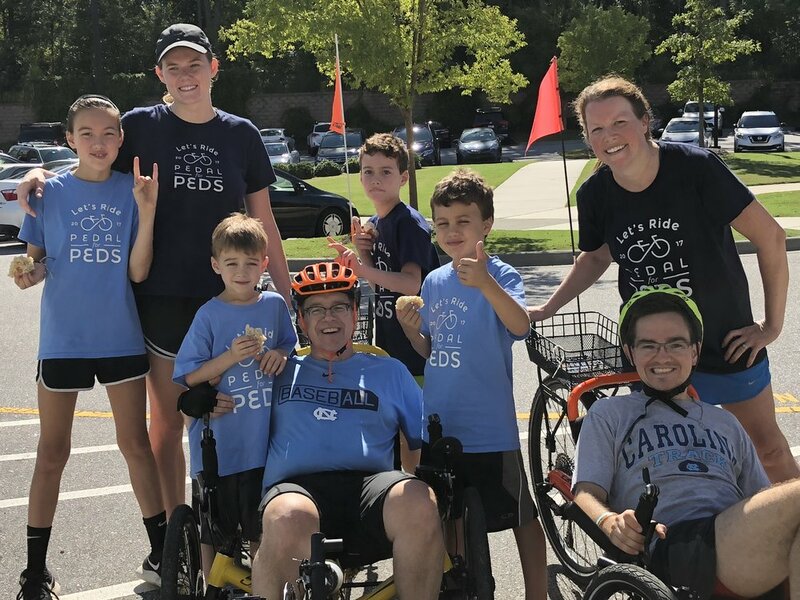 Pedal for Peds works to inspire hope for the community of the pediatric patients served at UNC Hospitals, their families, friends, caregivers and other supporters, while celebrating their courage, spirit and energy. Pedal for Peds began over seven years ago by Dr. Julie Blatt and her team. Inspired by the need for additional funds to support patient families as they cope with the life-changing effects of a cancer diagnosis. Support comes in the form of groceries, meals, gas cards and other essentials needed by the family to make their frequent stays at UNC a little easier to manage. As the Pedal for Peds initiative has grown, the program has been able to expand to help support a number of fellowship positions for the Division of Pediatric Hematology Oncology. Through their dedicated work and research, we contribute to identifying ways to improve the overall well-being of our patients. Over the past 9 years, we have collected hundreds of wonderful memories at our events. Lucky for us, a number of talented volunteers have shared their photos with us! Check out these photo galleries from the past few years. If you have any photos you would like to share, please contact Stephanie Mazze. Join our Pedal For Peds event team and various special guests of the clinic and local area Sponsors as we commemorate this truly special event! Registration $30 through event day. Trail bike riders will leave from UNC's Cary Wellness Center at 9am and go by bike to the American Tobacco Bike Trail entrance 1.5 miles away. We will have the trails clearly marked for a distance up to 50 miles (round-trip). Feel free to travel all or part of the trail. Fitness Instructors from UNC Cary Wellness Center will be on-hand offering hourly spin classes with music at 9AM, 10AM and 11AM. You can “ride” with them or go at your own pace. Team captains will choose their 1 hour spin class during registration. Each team registration reserves one bicycle. Members of a team may then ride a "leg" of any increment. Teams are limited to 6 riders per bicycle at this time. Registration $20 through event day. There will be 2 one-hour yoga sessions run by the UNC Wellness Center and our own Cammie Presler! Sessions will be held at 10AM and 11AM. Everyone is welcome. Bring a mat if you can! *Class sizes are limited. Please register early in order to guarantee a spot in class. Who Can Participate? The Pedal for Peds Bike Ride is open to everyone of all ages. However, the Stationary Bicycles are adult-sized. Can I register on the day of the event? Yes, absolutely! Please go to our registration desk (which will be clearly marked) on the day of the event. Can I make a donation? : Donations are welcome! What happens if it rains? Pedal for Peds brings the best out of all of us - so rain or shine we'll be there! Where's does the American Tobacco Trail go? The American Tobacco Trail winds its way through Wake and Durham Counties. For the Pedal For Peds event day we will have the trail clearly marked for you in both directions. Need a map? No problemo! Here are a few trail maps that have been created by the American Tobacco Trail System. The Division of Pediatric Hematology Oncology is a part of the Department of Pediatrics and Lineberger Comprehensive Cancer Center at UNC and a member of the Children's Oncology Group, a national consortium of pediatric cancer centers. Our program has active inpatient and outpatient services. In addition to on-site clinical activities, program members see patients in Wilmington and at the N.C. Children's Specialty Clinic in Raleigh. Our division specializes in the diagnosis, treatment and management of hematological disorders and malignancies in children and adolescents. We also offer bone marrow transplantation through our combined adult-pediatric bone marrow transplantation program. We maintain comprehensive clinics in hemophilia and bleeding disorders, oncology, sickle cell disease, general hematology, brain tumors and long-term follow-up. You can learn more about the specific programs and services offered through our division on the Programs and Services page. Our mission is to treat and cure children and adolescents with cancer and blood diseases who live in North Carolina through participation both in national and locally designed treatment protocols. We believe that the care of children with cancer is a dynamic process based on improving treatments through clinical and laboratory research. The following list of organizations have pledged their support for this year’s Pedal for Peds fundraising drive. At Shire, we are champions for people around the world who are struggling with rare diseases – they are at the center of everything we do. Our 23,000+ employees come to work every day with a common purpose: to develop and deliver breakthrough therapies that enable people with life-altering conditions to live their lives to the fullest. All of this year's marketing, branding and communications services have been generously donated by Aaron Mazze with Inveniv. Sponsor list current as of September 2018. If you would like information on how to get your organization involved, please check out our Sponsorship Levels Guide. Then, when ready, you may contact Julie Blatt, M.D., Division of Pediatric Hematology Oncology at jblat@med.unc.edu or 919.966.0590 to secure your sponsorship slot for this year's event. UNC Lineberger, Attn: Julie Blatt, M.D.